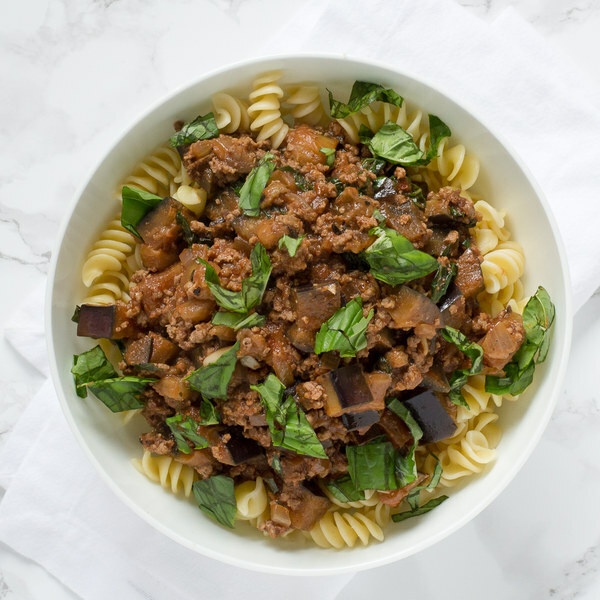 ← Beef & Eggplant Ragu with Rotini Pasta. Fill a medium saucepan about halfway with hot water (from the tap); cover with a lid and bring to a boil over high heat. While the skillet heats up, trim off and discard the ends of the eggplant; medium dice the eggplant into ½-inch cubes and transfer to a bowl. Once the skillet is hot, add the ground beef; cook, breaking apart with a spoon, until browned and crumbly, 3 to 4 minutes. Once done, transfer to a bowl, leaving the juices in the saucepan. When the water in the saucepan comes to a boil, uncover the pan and season the water with salt, then add the pasta and stir for a few seconds. Cook the pasta, uncovered, for 11 to 12 minutes (or according to package directions). Drain the pasta in a colander, reserving ½ cup of the cooking water. Once the beef has been transferred, add the eggplant to the skillet; cook, stirring occasionally, until slightly softened, 4 to 6 minutes. While the eggplant cooks, trim off and discard the root ends of the garlic; peel and mince or press the garlic. Add the garlic, oregano, crushed red pepper, and tomato paste to the skillet; stir until fragrant, 1 to 2 minutes. Add the ground beef and tomato sauce to the skillet; season with salt and pepper. Bring the mixture to a boil, then reduce the heat to medium-low and simmer for 4 to 6 minutes. Pick the basil leaves off the stems; discard the stems and roughly chop the leaves. Add the pasta, reserved cooking water, and about ¾ of the basil (save the rest for garnishing); stir until the ragu and pasta are well combined. To serve, divide the pasta between bowls and garnish with the remaining basil. Enjoy!